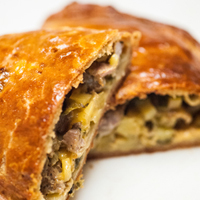 This savory strudel is filled with Bockwurst, Onion, Bock and Caraway Jam, and Gouda cheese. 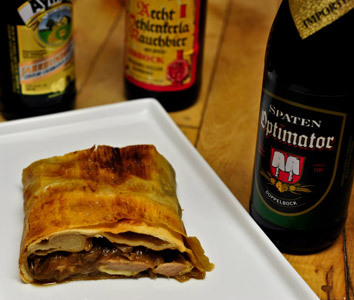 Try serving this strudel to your friends and family instead of brats stewed in beer. The flaky layers of the pastry with similar flavors will be a refreshing treat, and you’ll be paying homage to the German cuisine. 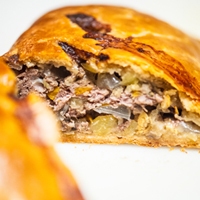 A German style savory strudel, filled with bockwurst style sausage, onion bock and caraway jam, gouda cheese and German mustard. 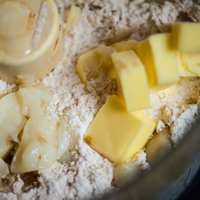 Make the Duck Fat Strudel Dough. 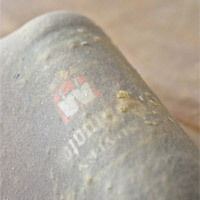 After the dough has rested, create a large work surface, as this dough rolls out to a very large rectangle (3 to 4 feet by 4 to 5 feet). Take a large tea towel, clean sheet or tablecloth, and drape it over the work surface. Lightly flour the cloth to prevent sticking. The cloth will be used to help roll the finished strudel. 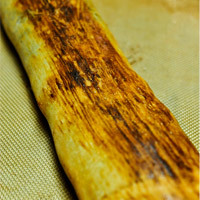 Using a floured rolling pin or 22 ounce beer bottle, roll out the half of the dough to a large rectangle. Now, carefully pick up a corner of the dough, placing your knuckles (removing any rings) under the dough, and lightly pull your hands apart, stretching the dough. Once the strudel is roll out, brush a thin layer of butter | duck fat over the dough, add a thin layer of the mustard in the shape of an 18-inch-by-4-inch rectangle. 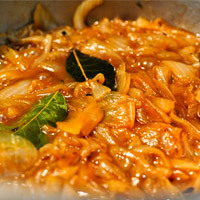 Spread the Onion Bock and Caraway Jam (make sure the jam is at room temperature and not hot, as the heat can melt the dough) over the mustard. . Next, take the sausages, slice them on the bias and slightly overlap them onto the rectangle. Top with the grated cheese and season with thyme, salt and pepper. 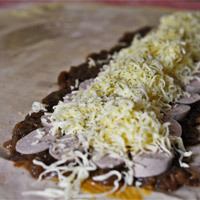 When adding the filling, arrange it within the edges of the dough that will ultimately be the final size of the finished strudel, similar to that of making a burrito, taking into account the amount of filling relative to the length and width of the finished strudel and the baking tray. A standard sheet tray will hold a 18-inch-by-4-inch strudel. Now, fold the bottom 1/5th of the dough over the filling. 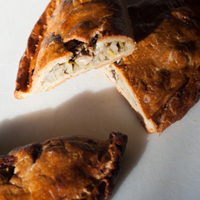 Fold over the sides of the dough to make the filling snug inside the dough. 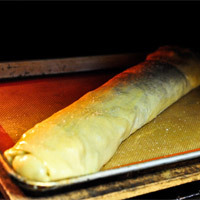 Lift the cloth underneath the dough and let the strudel roll over onto itself. Continue to roll until the dough is completely rolled. Make sure that the dough is not formed in a spiral, as the inside layers will not cook. 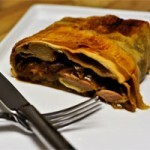 Take the strudel, still on the cloth, and transfer it to a sheet tray lined with either a Silpat or parchment paper. If the strudel is too big to fit on the sheet tray lengthwise, shape the strudel into a horseshoe. 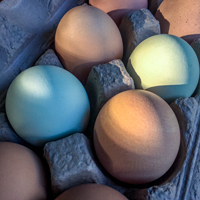 Brush the top and sides of the strudel with the egg wash to give the finished strudel a golden brown crust. Preheat the oven to 400°F | 204°C. Bake the strudel for 35 - 40 minutes, or until the outside of the strudel is the color of an English Mild (a golden brown hue). Remove from the oven and let cool for at least 5 minutes before slicing with a serrated knife. Serve with more of the mustard used in the filling. With the richness of the Onion Bock and Caraway Jam, a similar Bock, Vienna Lager or Märzen | Oktoberfest would compliment the strudel nicely. To contrast the dish, try pairing with a Schwarzbier, Altbier or German Pilsner.